The situation of this Parisian Temple of Music could not be improved. It stands in the centre of Paris; and if the Boulevards may be compared to an outstretched necklace, the Place de l'Opera is its medallion, of which the Opera House itself is the resplendent gem. The choice of this most valuable site for such a purpose is an admirable illustration of the way in which the municipal government of Paris looks to the permanent embellishment of the city rather than to the saving of a little money at the cost of symmetry and beauty. Thus, in the very heart of Paris, a large tract of territory was taken by eminent domain. Buildings were swept away, streets were completely changed, and finally the imposing Avenue de l'Opera was cut through narrow streets and shops for nearly a mile, connecting thus the Louvre and the Academy of Music, and displaying the latter to the best possible advantage. Subsequently, of course, the land on each side of the avenue and in the vicinity of the Opera House increased enormously in value. We often practically hide our handsome edifices by giving them no perspective, wedging them in amid a multitude of other structures; or, through a false economy, we make the rear of public buildings of a cheaper material than their facades. Not so in Paris. The Opera House is surrounded by some of the finest of Parisian thoroughfares. No narrow alleys cluster in the rear, where "supers" make their exits and their entrances. No low saloons cling to its walls like barnacles. It stands alone, imposing and majestic, possessing its own private courtyard like the area of a castle. The color of the stone of which it is composed is not so clear and creamy as it was a score of years ago, but nothing can detract from the harmonious outlines of the edifice itself. The gilded harp which the colossal statue of Apollo holds at such a dizzy height, reflects the morning sun an hour before its radiance falls upon the stairway leading to the portals. On each side of the roof, gigantic forms in bronze cut their triumphant silhouettes against the sky. The dome resembles an imperial coronet, below which is displayed the beautiful facade, adorned with fine Corinthian columns, marble busts of celebrated musicians, and groups of statues in relief. The Foyer Of The Grand Opera House. 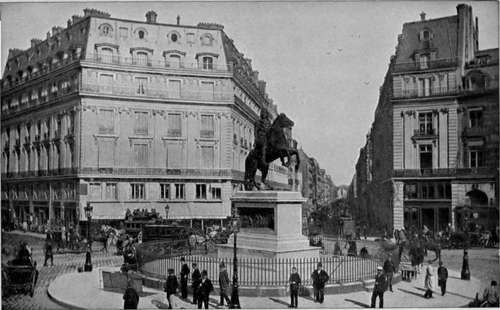 Place De La Victoire And Statue Of Louis XIV. 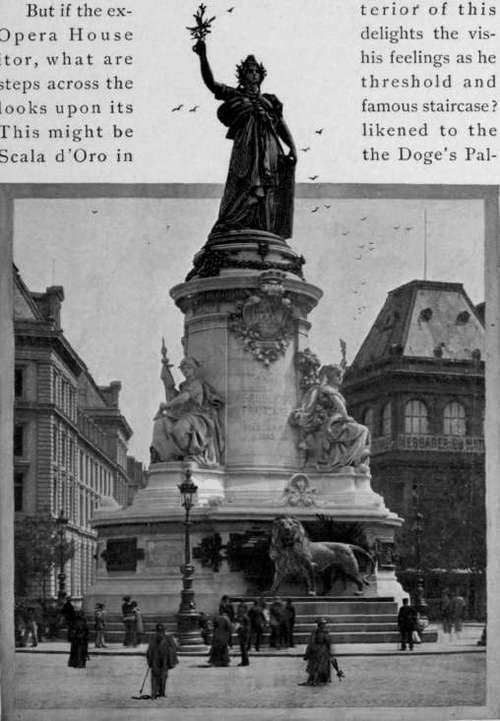 Statue Of The Republic, Paris. Ace, over whose surface none might pass save those whose names were written in the Golden Book of Venetian nobility. 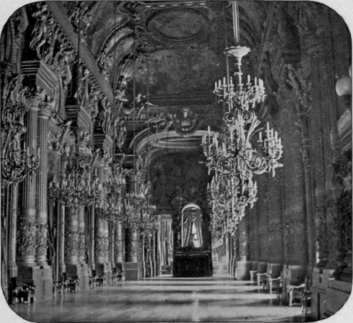 At all events, only the richest and most elegant costumes seem worthy to adorn this glittering expanse; for the broad steps are solid blocks of snow-white marble, the balustrades are made of onyx or of alabaster, while banisters of jasper rest on pedestals of malachite. After ascending a few steps of this staircase, one reaches a platform where the path divides to the right and left, apparently at the command of two colossal caryatides in bronze. Between their ponderous forms one sees the entrance to the amphitheatre and parquet, and, looking higher, discovers numerous bronze balconies, as delicately wrought as perforated screens, and scores of monolithic columns of polished granite or jasper from Mont Blanc. When one has stood by one of these balconies at the close of an opera, and watched the brilliant throng descending amid a blaze of light, he has beheld a sight unequaled in the world. It is safe to say that every one who leaves this building after a performance is thoroughly satisfied with all that he has seen and heard. It is true, one does not always find upon the stage stars of extraordinary brilliancy; but the French claim, with reason, that it is not meteors, but fixed constellations, that constitute a firmament. Therefore, the troupe of singers here is not like a flock of migratory birds, pausing for a few nights in a temporary resting-place, but is a well-trained, permanent organization, whose voices and peculiarities become so thoroughly adapted to each other that they at last, together with the orchestra, produce the impression of one grand, harmonious instrument of sound.